I first stumbled across this week's Spotlight Mom, Dina Houser, of Ola! Foods while food shopping at Stew Leonard's here in CT. Our closest Stew Leonard's is about an hour's drive away, so we only go every few months, at which time I stock up on CT-produced products, as well as many of their healthy snacks. While looking for a new cereal to try, I found myself drawn to a bad of Ola! granola. While I love granola...usually grab handfuls straight from the bag to munch on...I haven't been reaching for it in the AM to put in a bowl with milk for breakfast. I loved that this granola was 100! natural, handbaked, and just being able to look inside the bag and see the granola and add-ins like nuts, cranberries, etc. made it that much more appealing. I ended up picking the bag of granola up off the shelf and started to read the back cover to check for the nutritional values. Right when I started to read it, the girls started to act up, which was my cue to move along and check out fast, before we had full fledged supermarket tantrums to deal with. I ended up picking up a bag of the cranberry orange pecan granola from Ola! Foods to try. Within a few days of buying this handbaked granola, I found myself shaking out the crumbs, hoping that there was a little bit left. Not having seen this brand in my local grocery stores, I took to the Internet to learn more about the brand and to see if I could order it online or where the closest retailer was who carried this oh so tasty granola. Stay tuned this upcoming Friday when I will be sharing more about Dina's line of hand baked granola, which is available in bags and even snack size, in a variety of flavors. In addition to my review, I will also be offering one lucky reader the chance to win a tote bag filled with a sampling of Ola! Foods granola to enjoy. But, in the meantime, please enjoy my Spotlight on Mom interview with Dina Houser of Ola! Foods. Age of Company: 5 yrs. 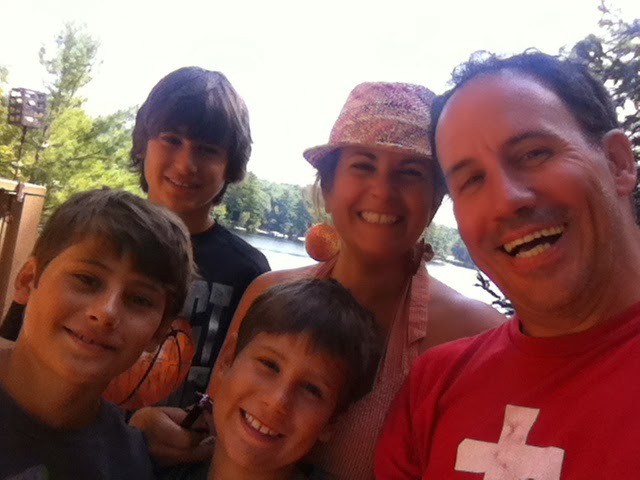 I live in Redding, CT with my husband Kurt of over 20 years, and my three beautiful sons who are 15, 13, and 10. I am a graphic designer by trade and was a partner with my husband in our design business prior to launching Ola! Granola. I had made granola for many years to give as gifts to friends and family as a healthy treat. They loved it and always encouraged me to sell it, but the timing never seemed right, being so busy with my business and raising three young boys. Timing is everything, right? So when the recession hit, I figured it was now or never. That was the catalyst in starting my own brand, Ola! Foods five years ago. I also love to cook, so having a passion for food has certainly helped me in this endeavor. I often tell people that when I was deciding my path in life, I was torn between becoming a designer, chef or a psychologist. I now joke that I feel I’m using these careers everyday in this new chapter of my life with Ola! When I finally decided to bring my 100% natural granola recipe to market, I knew the importance of also creating a brand as well as a product line. I decided to initially launch on Earth Day 2009 with two flavors, Vanilla Almond and Cranberry Orange Pecan and every aspect was hand done in very small stages. I had a big support group of friends and family, which was a tremendous help! We now have four flavors that are gluten-free, Non-GMO, vegan and only 100 calories per serving in various sizes including Chocolate Banana Chip and No Nut Vanilla. Ola! is simply delicious! As I mentioned, in my design business, naming other company’s brands and taking a project from concept to a finished product was our expertise. So once I decided to bring my family’s granola recipe to market, I wanted a name that conveyed exactly what our product was- fun, family friendly and approachable, hence Ola! (btw this stemmed from the last three letters in the word granola). In the early days, our entire family’s focus and attention was on Ola! and everybody pitched in where they were needed. I’m proud and happy to teach my boys good life skills and demonstrate to them how something is created and the process that unfolds. Now five years later, my children are truly able to see that by working hard at something you can accomplish anything you set your mind to. It may not be easy, but you need to learn to solve any obstacles that may come your way. My day typically starts at 5am during the week (6:30am weekends) to do some form of exercise. It’s early (and dark and cold in winter months), but I’ve found this is the only time I can fit it into my schedule. I either walk for 2-3 miles with my dog Spencer, or I jump on my spinning bike for an hour or so. It’s a nice quiet time for myself and I need exercise for my physical and mental health. Over the course of the next two hours, and the help of my husband, I get my three kids off to school and myself out the door by 8 and head to Ola’s facility. Our offices, kitchen production area and warehouse are all housed under one roof, so the day is spent working very closely with my team. My time is spent on the many layers that building sales and a brand entails as well as dealing with the manufacturing end of things. I have a good 40 minute drive home and then it’s dinner on the table (our family always sits down for dinner together), managing the kids after school schedules, maybe an exercise class and then catching up on work later in the evening. I don’t drink coffee but I love having something hot to drink, especially in the cooler months, so I’m continuously drinking an herbal or green tea throughout the day and night. It’s my little luxury that I so enjoy. Then the routine starts all over again the next day! The amount of cash that is required to properly launch and brand a new product. Many stores require slotting fees for your product to be their shelf. Add to that quarterly promotions and marketing expenses for events, demos and sampling efforts, and it’s a huge burden for a small company. I am a graphic designer by trade and was partners with my husband in our design business prior to launching Ola! Granola. Before starting our design business, I worked as an art director for Martha Stewart Living, J.Crew and small boutique agencies on logos, packaging, and editorial for magazines and coffee table books. I’m a creative person, so I am still able to get these juices flowing with the many design aspects that are involved with branding Ola! Being accepted into Whole Foods and to Stew Leonard’s and delivering that myself to the loading dock, The CT Specialty Food Association product awards we’ve received, our facility expansion, bringing on my partner Greg, being awarded a Proclamation by Governor Malloy, and the very first bag I made and packed! I find the grocery industry a challenge. All product categories have a review schedule, which sometimes only comes once a year. If you miss the date, you need to wait for the following year, so it can be a very glacial process. I’m the kind of person who tackles a project or problem head on, quickly finds a solution and moves on. In my previous career overseeing various jobs with deadlines trained me very well. So the amount of time it takes to get product on shelf becomes frustrating as I don’t have the patience to wait and I just want to see it in people’s hands! My kids, husband, and I always try to remember how lucky I am to have them, and that we are all blessed with good health. That’s what really matters. Exercise and good healthy eating habits is so critical. Taking that time for myself in the early morning or early evening is vital to putting things in check and gives me time to think and reflect. Also, I learned to say “no”. Sometimes you can’t do everything, even though you may want to. Good question. I hope to expand on the product line and add other healthy snacks that are family friendly but right now I am just taking it one day at a time. Do your homework and know what you are getting into, write a business plan and ask for help! I wouldn't have made it if it weren’t for the assistance of friends and family. They can always say no, but at least give them the opportunity to do so, and you never know, they may say yes! They have really good granola. My favorite is the No Nut Vanilla, goes great in yogurt. Love this stuff. I love granola for a quick healthy snack for the family. I haven't heard of this brand yet I will have to try theirs.